Managers are frequently aware of the risks of associated with some popularized occupational exposures such as asbestos and radon, yet few think about diesel engine exhaust is one of the potent risk factors for developing cancer. It is a serious concern: according to Carex, approximately 897,000 Canadians are exposed to diesel engine exhaust at work. This exposure occurs primarily in transportation-related occupations, including truck drivers, bus and subway drivers, locomotive engineers, and bus garage workers, trucking company workers, forklift operators, firefighters, garage attendants, traffic controllers, mechanics, taxi drivers, couriers and professional drivers. In fact, Health Canada attributes an estimated 80% of particulate matter PM10 in the transportation sector to diesel engines. Other workplaces with a significant risk of occupational exposures include mining, construction, rail, farming and military. The health effects and mechanics of diesel engine exhaust. What exactly is diesel exhaust and what makes it dangerous? The International Agency for Research on Cancer (IARC) has classified diesel engine exhaust as Group 1, which means it is carcinogenic to humans, based on sufficient evidence for lung cancer. The danger hides in the particulate matter contained in diesel engine exhaust. Studies have shown increased rates of lung cancer when inhaling whole engine exhaust while other studies where the particulates were removed were inadequate to determine carcinogenicity. The science and mechanics behind the results of the studies are somewhat complicated. Diesel engine exhaust (DEE) is a complex mixture of substances characterized by polycyclic aromatic hydrocarbons (PAH) surrounding an elemental carbon core. The gas phase chemicals present in diesel exhaust include nitrogen oxides carbon monoxide and volatile organic compounds such as benzene and formaldehyde. The particulate fraction comprises elemental carbon and organic carbon, ash, sulfate and metals. Polycyclic aromatic hydrocarbons and nitroarenes are distributed within the gas and particulate phases. PAHs are easily absorbed onto the elemental carbon particulate, which has a large surface area, and are likely the cause of carcinogenicity for diesel engine exhaust. Even a short-term workplace exposure to diesel engine exhaust can harmful to human health. It can irritate the eyes, throat, and bronchi, and cause light-headedness, nausea, and respiratory symptoms. Moreover, diesel exhaust may initiate allergic reactions or increase immunological response to other allergens. Upsurges in hospital admission, higher incidence of respiratory symptoms, and decreases in lung function are all associated with exposures to airborne particulate matter, including diesel particulate matter. Controlling diesel engine exhaust exposure. Generally, employers must take all reasonable measures to keep workplace exposures to carcinogens to a minimum. Employees who may encounter confirmed carcinogens should be properly equipped to eliminate all exposure to the carcinogen or, if not reasonably practicable, to reduce it to the fullest extent possible. The quantity and composition of diesel engine exhaust emissions vary depending on the type of engine, the composition of the fuel and many other factors such as the use of a catalytic converter. Ask THEM about developing a sampling strategy to assess occupational exposures to diesel engine exhaust in your workplace. Call and speak to the experts. Since diesel engine exhaust is such a complex mixture of chemicals, employers should consider engaging a qualified person (QP) such as a Certified Industrial Hygienist (CIH) or a Registered Occupational Hygienist (ROH). These QPs, including consultants with the above-mentioned designations, will help anticipate, recognize, evaluate and control workplace exposures to diesel engine exhaust. They have the expertise and experience to develop an effective sampling strategy for workplace assessment and recommend measures to control workplace exposures. Contact us for more details and a free phone consultation to get started. 1 . 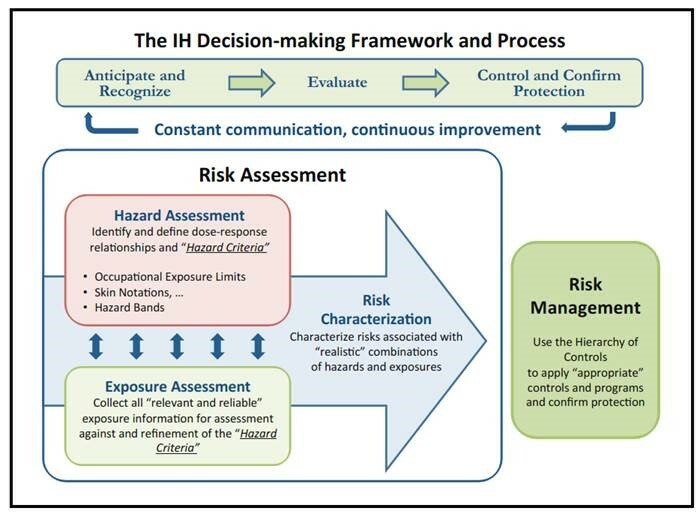 Development of an exposure assessment strategy: This includes choosing the right decision criteria for acceptable exposures. This could be OELs, DNELs or occupational exposure bands depending on the evaluated chemical. 2 . Basic Characterization: The QP will gather information to characterize the workplace, workforce and environmental agents. This is where the assistance from the employer will be key. 3 . Exposure Assessment: assess exposure in the workplace by grouping workers into similar exposure groups (SEGs) and evaluating all applicable exposure routes (dermal, inhalation, ingestion). 6 . Verification: Reassess to verify that acceptable exposures remain acceptable. 7 . Documentation: Communicate and document results.